Live In Edmonton’s Most Innovative Lifestyle Neighbourhood. Laurel Green, southeast Edmonton’s most popular neighbourhood, now offers the city’s most fun and sociable enclaves in Terrace Park. Terrace Park introduces a fresh approach to planning that enhances neighbourhood interaction, engagement and healthy living. 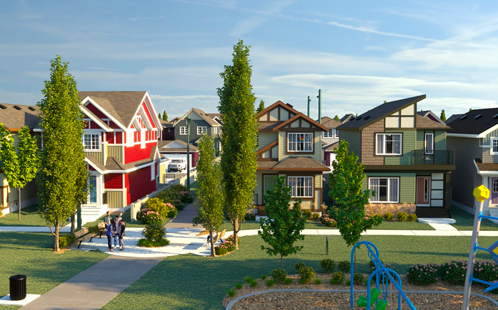 Beautiful single family laned homes open onto a vast green space as their “front yard.” This exclusive area boasts recreational amenities including tree lined paths with decorative bollard lighting, a handicap-accessible playground and two tot lots. Plus lots of open park space. Homes, master built by Homes by Avi and Landmark Homes, offer unique benefits which are profiled in their six new show homes. They have upgraded exterior architecture on the front and back, front porches, full landscaping, maintenance free vinyl fencing and an extra-long pad with the rear garage that permits up to four cars to park. Ground maintenance is managed through a Homeowner's Association. Meadows Recreation Centre, the “crown jewel” of southeast Edmonton, is an eight minute walk from Terrace Park. 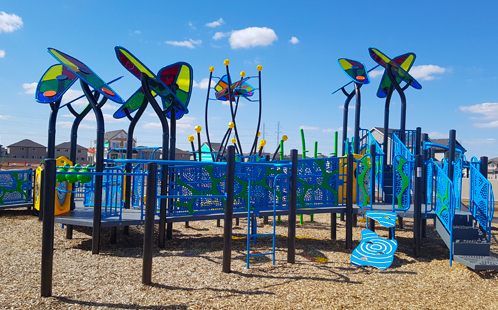 The new Svend Hansen K to 9 public school is a five minute walk away and access to Anthony Henday Drive is three minutes away.